THURSDAY, April 14, 2016 (HealthDay News) -- Psoriasis patients may face a higher risk of an abdominal aortic aneurysm, though the overall odds of experiencing this potentially deadly blood vessel rupture are small, new research shows. The Danish scientists also found that the more severe the psoriasis -- a chronic autoimmune condition characterized by scaly, red patches of skin -- the more likely a person will develop an abdominal aortic aneurysm. They believe the two conditions share overlapping inflammatory processes in the body. "The association between [abdominal aortic aneurysm] and psoriasis has not been examined before, but we are not surprised by seeing a heightened risk in our study," said lead researcher Dr. Usman Khalid, a fellow in the department of cardiology at Herlev and Gentofte Hospital in Hellerup, Denmark. "Our results add to the evidence that there is an increased risk of various cardiovascular diseases in patients with psoriasis," Khalid added. The study is published April 14 in the journal Arteriosclerosis, Thrombosis and Vascular Biology. 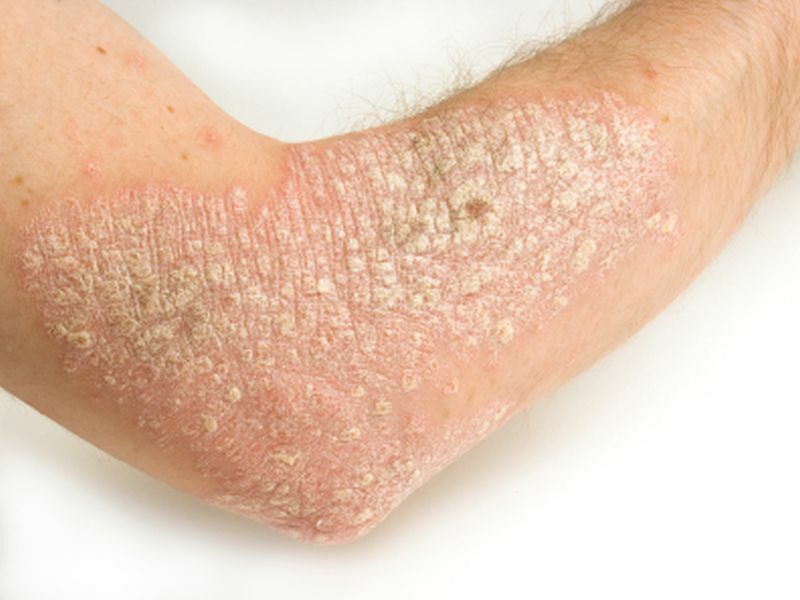 About 7.5 million people in the United States are affected by psoriasis, an incurable condition that occurs when the immune system attacks healthy skin cells, causing them to shed more quickly, according to the American Academy of Dermatology. Abdominal aortic aneurysms occur when the main blood vessel supplying blood from the heart to the abdomen becomes enlarged. Often, there are no symptoms until there is a rupture, which can often prove fatal. Their prevalence increases with age and affects about 2 percent of people 65 and older, typically men, according to the study. Khalid and his team analyzed more than 59,000 patients with mild psoriasis and 11,000 patients with severe psoriasis using 14 years of data from nationwide registries in Denmark. The patients were tracked until they were diagnosed with an abdominal aortic aneurysm, died, moved or the study ended. The researchers found that patients with mild psoriasis were 20 percent more likely to develop an abdominal aneurysm than people without psoriasis. And those with severe psoriasis were 67 percent more likely to develop an aneurysm. However, the study did not prove that psoriasis causes these aneurysms, merely that an association exists between the two conditions. "More research is needed to explain the causal mechanisms," Khalid said. "Nonetheless, our findings not only stress the need to treat the symptoms of the skin disorder, but also a regular evaluation of the risk factors that are associated with cardiovascular disease outcomes. "Also, patients with psoriasis must be encouraged to change [an] unhealthy lifestyle and adhere to a daily program that will minimize the risk of cardiovascular problems," Khalid added. Dr. James Elder, a dermatologist at the University of Michigan Health System, contended that screening psoriasis patients for these aneurysms -- which involves expensive imaging tests such as ultrasound or CT -- isn't cost-effective. "You'd only find one [extra] case for spending a lot of money," said Elder. Elder agreed with Dr. Katherine Cox, a dermatologist at Houston Methodist West Hospital in Texas, that the study offers useful information, especially since it showed psoriasis seems to be an independent risk factor for abdominal aortic aneurysms, beyond patients' other heart risk factors. "We have known for a long time that psoriasis is not just a skin-deep issue. We've known there's a cardiovascular risk issue with psoriasis. So, it's not surprising to see now that it's connected with [abdominal aneurysms] as well, especially since they share similar inflammatory pathways," said Cox. "Being able to give [risk] numbers to patients makes it more real for patients," Cox added. Abdominal aneurysms "are a silent killer. I'm not a cardiologist, but because a lot of people are asymptomatic for it, because they're not looking for it, they may miss it," she said.